I was quite unprepared for Marina Piccinini’s accent, which is as exotic as her background. Her mother is Brazilian, her father is Italian and she was born in the USA where her father, a mathematician, was a graduate student. Her mother was homesick, so the family returned to Brazil and stayed there until Marina was eight, when her father was invited to teach in Switzerland. A few years later her father accepted a position in Newfoundland, so Canada was added to the mix. Some years after that, Marina went to the Juilliard School. ‘I’m a New Yorker, if anyone asks,’ she says with a laugh. That does, in fact, explain everything. Marina’s first musical experience (‘A somewhat tacky story,’ she admits) was a performance of The Magic Flute at the Zurich Opera, which entranced her and led to her life-long love of opera and the singing voice. After the performance she announced, ‘I’m playing the flute.’ (Announced, she stresses, not asked.) She was too small for a flute, so she was given a recorder. She hated it, but played it for two years. On arriving in Canada, Marina finally got her flute and joined the school band. Flute teachers were scarce in Newfoundland, so her first teacher was a trumpet player and conductor who taught her to play using the Rubank elementary teaching book. This teacher also taught her how to breathe. ‘This is how you do it on a trumpet,’ he told her, and gave her instructions which turned out to work perfectly well on the flute. Apart from these lessons, she taught herself until she was sixteen. When she finished high school someone told her of a good flute player in Toronto. She hadn’t heard of her, or, indeed of many other flute players, as she mainly knew singers and loved opera. The player in Toronto was Jeanne Baxtresser, at the time first flute in the Toronto Symphony Orchestra and professor of flute at the University of Toronto. Marina, then still aged sixteen and therefore too young, applied to the University of Toronto, having been, as she puts it, somewhat creative about her age. She got in and spent a year studying with Jeanne Baxtresser, who was, for Marina, a fantastic teacher. After a year her teacher said Toronto was the wrong place for her and suggested she go to Juilliard in New York. At the age of eighteen, Marina enrolled at Juilliard to study with Julius Baker, the first flute in the New York Philharmonic Orchestra. While at Juilliard, Marina met and fell in love with her fellow student Andreas Haefliger, the pianist son of the great Swiss tenor Ernst Haefliger. She had been offered a place at the Tanglewood Festival, but chose instead to spend her summers in Switzerland with Andreas. It turned out that Ernst Haefliger was an old friend of Aurèle Nicolet, who had been first flute in the Berlin Philharmonic Orchestra when Ernst Haefliger had been at the Berlin Opera. Lessons with Nicolet were arranged. Marina says they provided a wonderful change from the teaching at Juilliard. In fact, she has only ever had three teachers: Baxtresser, Baker and Nicolet. Another huge musical benefit of spending summers in Switzerland was that Ernst Haefliger taught a masterclass in Zurich. He invited Marina to play obbligato flute parts from Bach arias with his students. This, says Marina, was a wonderful learning experience, and she even got paid for it. All the while she continued her lessons with Nicolet. Teachers, says Marina, never stop. She recently played the Ibert Concerto in Basel, and played Debussy’s Syrinx as an encore. Aurèle Nicolet was in the audience. He went backstage afterwards and gave Marina a lesson on Syrinx. ‘Once a teacher, always a teacher,’ she says. A year after Marina arrived at Juilliard, Julius Baker retired and was replaced in the NYPO and joined at Juilliard by Jeanne Baxtresser, with whom Marina has maintained a close friendship. ‘Jeanne is my daughter’s godmother,’ she says, ‘and she gave me many of her beautiful concert dresses. Julie Baker used to say he was passing on the torch of great Jewish flute playing—Jeanne is passing on the torch of great flute dresses!’ Jeanne Baxtresser, says Marina, is ‘a wonderful woman, intelligent, compassionate, funny, diplomatic, caring’. As a teacher, though, she was surprisingly tough, especially at first. She used to tape her lessons. On one occasion Marina played Hindemith’s Acht Stücke. ‘Jeanne turned off the tape recorder and said she didn’t want to hear any mistakes in the future. She then turned the tape recorder back on. I was so shocked I made sure I never made any more mistakes.’ Marina says there has been a great change in her attitude. ‘Now Jeanne is a sweetie pie. Everyone loves her. I once jokingly asked her what had happened: did you get it all out on me?’ She now sees herself in Jeanne Baxtresser’s teaching. ‘If you want to be angry with a student you have to be not angry. If you are actually angry you cannot show it.’ Marina now teaches at the Peabody Institute in Baltimore, part of Johns Hopkins University. This, she says, takes some organisation as she has homes in New York and Vienna. Peabody has been very supportive. She has been allowed to run her studio as she wants to, and she has an assistant. When Marina is at Peabody she starts very early—at seven in the morning—and works all day. She has, she says, wonderful students from all over the world. Marina says she likes students who are interested in life, in music and the arts, who are self- motivated and independent. ‘I had to be independent, because I didn’t really have a flute teacher until I was sixteen. My life didn’t follow a pattern. I like students who follow their own path, rather than those who look to me to tell them what to do. They won’t get far without independence. I like it if students have their own likes and dislikes.’ Did she ever consider an orchestral career? In the 1990s she was offered the first flute job in the Boston Symphony Orchestra by Seiji Ozawa. She thought deeply about it, played many concerts, toured with the orchestra and recorded with them. It was a hard decision, she said. The BSO has two principals, but rather than playing complete concerts in turn, the principals are required to play half of each concert, which would have restricted Marina’s solo career. She remembers the moment she made the decision: she was just about to go on stage with the BSO to play Olivier Messiaen’s posthumous Concert à quatre (a little-known work for flute, piano, cello, oboe and orchestra) when she discovered she was pregnant. That made the decision tough—the security of a full-time job would have been good and she loved the BSO, but then she had just been taken on by Colbert management in New York, and the flexibility of a solo career became more attractive. She does have other orchestral experience. When Jeanne Baxtresser left the NYPO, the conductor Kurt Masur asked Marina to play a few concerts. She played one week with them, then a tour, but by then she knew it was only for fun. ‘Playing in an orchestra requires a different state of mind from being a soloist,’ she says. ‘I have made this choice, and I like it.’ She does wish she could play in an orchestra occasionally, and this sometimes happens. 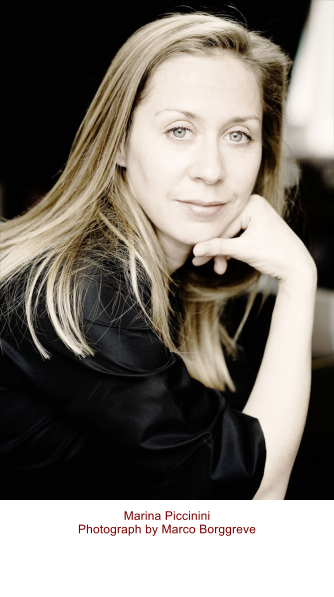 András Schiff has asked her to play in his chamber orchestra, but she is generally too busy. Her choice of music is interesting. She is committed to expanding the flute repertoire and has given the first performances of Matthew Hindson’s concerto en­titled House Music (performed with the London Philharmonic Orchestra conducted by Roberto Minczuk); Michael Colgrass’s Crossworlds, a concerto for flute, piano and orchestra which she performed with her husband Andreas Haefliger and the Boston Symphony Orchestra under Hans Graf; and Gran Danzon, a concerto for flute and orchestra by the Cuban composer Paquito D’Rivera, which she performed with the National Symphony Orchestra under Leonard Slatkin. She has a busy concert career and regularly performs as soloist with many of the world’s great orchestras. She is a busy chamber music player who has worked with the Tokyo, Brentano, Mendelssohn and Takács string quartets and with Nexus, the percussion ensemble.She is a regular participant in festivals at Marlboro, Santa Fe, Spoleto and others, and she has performed at the Saito Kinen Festival in Japan at the invitation of Seiji Ozawa. She considers her work at the Marlboro Festival, which she first visited as a ‘young player’, to be a big part of her summer. As to extended techniques, Marina says she prefers not to use them. There are, she says, a limited number of techniques that really add to the flute, and a piece with extended techniques has to be a good piece of music first. ‘I love the sound of the flute,’ she says. ‘I don’t want it to sound like something else. I don’t like multiphonics because they don’t make a flute sound great—they make it sound like a pipe. If you want to do that, get a pipe! I say that with all due respect to those people who are good at multiphonics.’ She says she loves the Boulez Sonatine—‘A great piece, with not one extended technique.’ She once played the Boulez with Bruno Canino, who used to play it with Severino Gazzelloni, the pioneer player of contemporary flute music. Canino was amazed, she says, at how easy it was to play it with her. Since Gazzelloni’s day, says Marina, this work has become not so difficult. ‘I always go back to what brought me into music, and that’s great singing,’ says Marina. ‘What’s fantastic about being a musician is you only get better. As long as you practise hard and keep in good shape, you’re always finding something new. I can never understand people who say they’re bored with their instrument. I wouldn’t begin to understand this.’ Marina Piccinini’s life changed dramatically on 11 September 2001 when she opened her curtains to see one of the twin towers blazing and a spot heading for the second tower. This became for her a spiritual matter. Quite apart from the horror of the death and destruction, she realised that when she and her husband were away on tour, their daughter Chiara would be looked after by a nanny, and they had no family in New York. They did have family in Vienna, so they moved there. At least in case of disaster, she says, she knows her child will be looked after. ‘I don’t want to be a cellphone mom,’ she says, so she is particular about the concerts she takes. She and Andreas are often away, but, she says, when they are home, they are really home, with plenty of time to spend with their daughter. ‘I have a good life,’ says Marina. ‘I am wife to a great pianist and mother to a wonderful child.’ And, one might add, she is a rather wonderful musician. This article first appeared in September 2007 in Pan (now Flute), the journal of the British Flute Society.